Imagine, for example, that you are focusing on leaders. Let’s explore how the model may apply to people in leadership positions. Some leaders are both caring and competent. When talking about such a leader, people may say some of the following things. They show they care about people and the project … They make people feel welcome and valued … They show an interest in people and their ideas … They are good at making others feel important rather than trying to make themselves feel important. They create a positive environment in which motivated people can achieve peak performance … They have the strategic thinking and other skills required to do the job … They keep communicating the organisation’s purpose, principles and picture of success. They enable people to perform superb work … They are good at making the tough decisions required to achieve the goals … They have a track record of delivering ongoing success. Looking back, can you think of a leader – or a person in another role – who was both caring and competent? This may be someone that you knew or someone that you heard about. How did the person demonstrate these qualities? What happened as a result of them translating these qualities into action? If you wish, try tackling the exercise on this theme. This invites you to begin by writing the name of the person. It then asks you to do the following things. 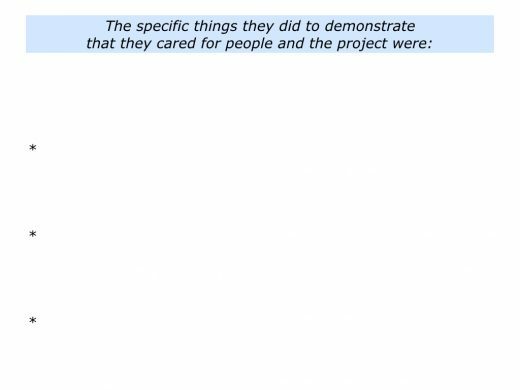 Describe the specific things the person did to demonstrate that they cared about the people and the project. 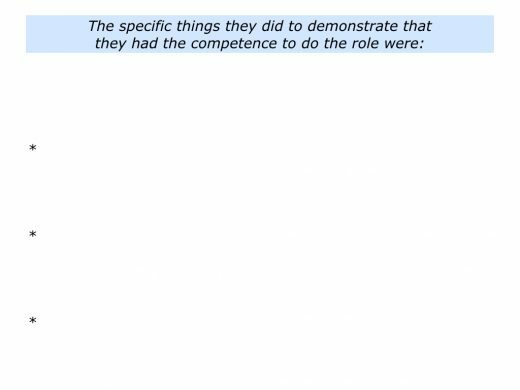 Describe the specific things they did to demonstrate their competence to do the role properly. 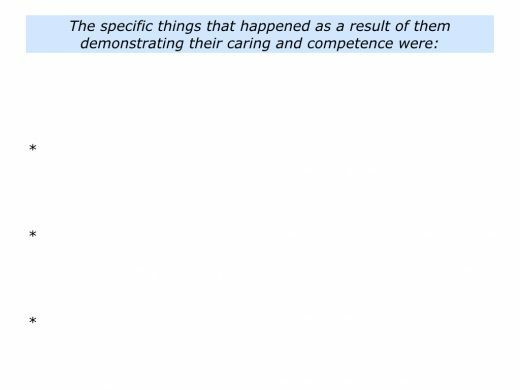 Describe the specific things that happened as a result of them demonstrating their caring and competence. Some leaders may be caring and incompetent. They may care about people and the project, but they do not demonstrate the required strategic thinking or skills. Some leaders are successful in some situations, however, but not in others. They may be good at running a start up company, for example, or an organisation that is facing certain challenges. But they may not have the competence to succeed in other situations. Some leaders are honest about their capabilities and may try to develop the required skills. Some may continue behaving in an incompetent way, however, and this can cause collateral damage. People who work for such a leader sometimes feel split. Whilst still liking the person, they see that employees may be confused and concerned. The incompetent leader’s actions can lead to the team or organisation ending up on the rocks. Some leaders may not seem to care about people or the project. The only caring they may demonstrate is for their own agenda. They may also not demonstrate the competence required to deliver the goods. People often switch off from such leaders. They put their heads down and get on with their own jobs. Losing belief in the team or organisation, they try to get satisfaction from their daily tasks or outside the work place. Such leaders can be cruel and dangerous. The only things they care about is their own agenda and power. They may be extremely competent at using techniques to pursue their aims, however, whatever the costs to other people. People who behave like authoritarians, dictators and psychopaths can demonstrate these characteristics. Such people are never satisfied, no matter how much power they gain. They must always win and, at the same time, make sure that other people lose. Let’s return to your own life and work. 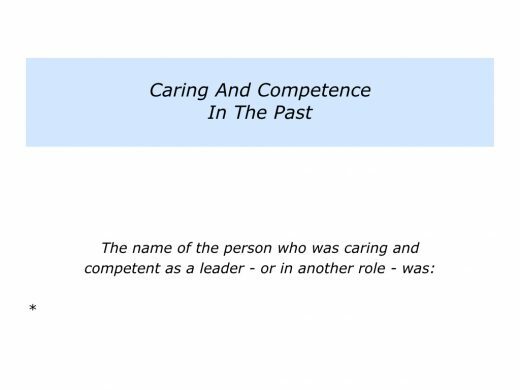 Looking ahead, can you think of a role or activity in which you want to be both caring an competent? You may want to do this as a parent, educator, sports coach, trusted advisor, leader or whatever. What do you do well in this role? 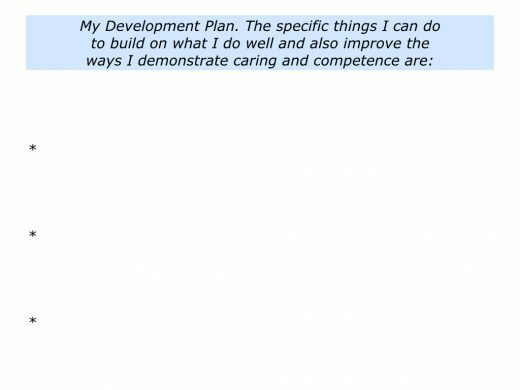 How do you demonstrate caring and competence? How do you translate these qualities into action? If possible, give specific examples. How can you follow these principles more in the future? If you wish, you can also get feedback from other people. When doing this, however, it is important to get responses from people whom you respect. How can you be even better at showing caring and competence? What are the practical steps you can take? What will be happening that will show you have achieved the desired improvements? There are many ways to clarify whether you or other people have the ability to perform a role properly. 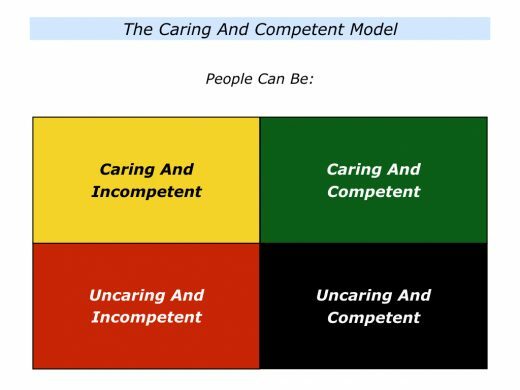 One approach is to use the caring and competent model. If you wish, try tackling the exercise on this theme. This invites you to describe a specific role or activity in which you want to be both caring and competent. It then asks you to do the following things. Describe the specific things you do well to demonstrate caring and competence. Describe the specific things you can do better to demonstrate these qualities. Describe the specific things you can do to build on what you do well and also improve the ways you demonstrate caring and competence.